Why they’re better than some four-year universities. In the higher education family, community colleges are typically regarded as the poor cousins. 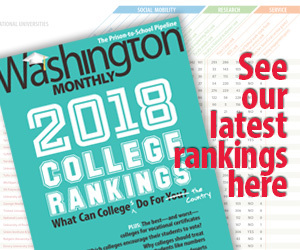 Big college guides like U.S. News & World Report and the Princeton Review devote few, if any, of their glossy pages to community colleges, while reporters and pundits for elite publications have little to say about them as well. Part of this is pure snobbery. Many of those who create and cover the mainstream college guides attended prestigious four-year schools—which helps to explain the annual preoccupation with whether Harvard or Princeton made the top of the list. Part of it is also economics. The commercial guides don’t have a market incentive to delve into the differences between hundreds of community colleges, because most students don’t shop for a community college—they simply attend the one nearest their home. Similarly, there’s not a lot of demand for articles about how best to play the applications game for such schools, because nearly any high school graduate can get into one. Still, while there may not be a profit motive to scrutinize community colleges closely, there are several profound public reasons to do so. For one, community colleges now represent a huge slice of the higher education pie: 43 percent of college freshmen begin their education at two-year institutions. Secondly, community colleges have taken on the toughest job in higher education: teaching lower-income students. In 1980, just 38 percent of recipients of a Pell Grant (the main federal need-based financial aid program) attended community colleges or other non-four-year institutions. By 2004, that percentage had leapt to 54 percent. Thirdly, for a student of modest means hobbled by an inadequate high school education, or with a family to care for and a job to keep, the difference between good teaching and bad teaching can mean almost everything. Research shows that the brightest kids succeed regardless of whether they’re taught poorly or well (one reason that many elite four-year schools succeed by doing little more than staying out of their students’ way). Students with the lowest levels of academic preparation, however, are most sensitive to the quality of the learning environment. Unfortunately, the learning environment at these colleges is far from the best it could be. Only 18 percent of community college freshmen earn a degree or certificate within three years. continuously, to think critically, to adapt to a changing economy. In other words, we now need community colleges to impart the same kinds of sophisticated learning and thinking skills that have traditionally been the province of four-year colleges. The final reason that it makes sense to rate community colleges is that it’s possible to do so honestly. Guides to four-year schools like the one published by U.S. News rely on measures that are only glancingly related to actual learning, such as the percentage of alumni who donate money or the reputation a school has among administrators of other colleges. In part, U.S. News relies on such dubious criteria because four-year institutions refuse to release data on the quality of teaching at their schools. We’ve combined this groundbreaking analysis with data on graduation rates to compile the first-ever list of the thirty best community colleges in America (click here to see the rankings). Conventional wisdom assumes that if you hold schools with low-income students to high standards, graduation rates will plummet. In fact, our list indicates that the opposite may be the case. CCSSE research has found that the level of academic challenge is positively linked with graduation rates. Indeed, the average graduation rate of colleges on our list is almost 50 percent higher than the national average for community colleges. Undergraduates who are taught well are more likely to succeed and ultimately complete their degree, meaning that the more colleges ask from their students, the more they get back. This suggests that many students aren’t dropping out because colleges are keeping their standards appropriately high—they’re dropping out because the standards are inappropriately low. Too often, administrators at community colleges hide behind the myth that it’s unfair to expect much of schools that serve traditionally disadvantaged populations. Our results beg to differ. College number five, Kentucky’s Hazard Community and Technical College—where 96 percent of students receive some form of need-based financial aid—tops hundreds of two- and four-year institutions in the measure of student-faculty interaction. At South Texas College, number twenty-one on our list, 95 percent of its 16,000 students are Hispanic, many of whom are first- and second-generation immigrants. (In fact, South Texas enrolls almost four times as many Hispanic undergraduates as the entire Ivy League.) South Texas scores particularly high on the “student effort” benchmark. Its students are more likely than most to prepare multiple drafts of assignments before turning them in, and to work on projects that require integrating information and ideas from various sources. Yet another prevalent myth in the world of higher education is that the more you spend, the better education you get. Indeed, U.S. News makes per-student funding the third-biggest factor in its rankings. But average per-student spending at the institutions on our list is virtually the same as spending at the typical community college, and tuition is actually lower than the average at other such schools. Needless to say, every college on our list spends a fraction of what a typical four-year college does. That doesn’t mean community colleges couldn’t use more money. But it’s clear that the most expensive schools aren’t necessarily those that teach students best. Exhibit A: Our number one school, Georgia’s Atlanta Technical College, is an urban college attended predominantly by African Americans. Most of its students study part-time while working and tend to focus on work-oriented credentials in health care, construction, and mechanics. CCSSE results indicate that Atlanta Technical gives students a great education despite spending 30 percent less per student than the average community college. What, then, are the conclusions to be drawn from our list? For community colleges, the main one is this: No more excuses. It’s just not very credible to blame subpar performance on funding levels or student demographics when schools like Hazard and Atlanta Technical are performing so well. For four-year universities, the conclusion is even tougher: They ought to be ashamed of themselves. Despite all their advantages—lavish campuses, brilliant scholars, social networks that no community college can match—the quality of the teaching at four-year institutions is less rigorous and less helpful than that found at the community colleges on our list. This is a stunning indictment of the extent to which teaching at many of America’s “best” universities has been neglected. The biggest lesson to be drawn from our list, however, is a hopeful one: Great teaching can happen anywhere. And if America is to succeed in the future, it needs to happen everywhere. It won’t, however, unless pressure is brought to bear on recalcitrant college administrators and faculty—pressure from the politicians who write the rules and the students and parents who write the tuition checks. Consider our best community colleges guide a modest bid to generate that pressure.